I haven’t blogged since a while, because I do not do much KDE hacking lately, but today I’ve got around to playing with QML again. Gah! Can you see it? The baselines are misaligned. Usually, you lay out text such that all letters “sit” on an even line (the baseline). The documentation does not mention any type baseline alignment in a Row element (or any type of vertical alignment in a Row element, for that matter). I then tried to hack around this problem by dropping the Row element and laying out the Text elements manually, but the elements in the repeater won’t anchor to each other. That’s probably a problem with the elements not being fully initialized when the anchor property is evaluated, but at this point I give up. This has been my second experience with Quick. When I tried it for the first time, my goal was a Quick version of the Planarity game. I got stuck when I noticed that Qt Quick 1 does not have any kind of line or ellipse primitive (only rectangles and images). Really?!? So, while I understand very well and appreciate the idea behind Qt Quick, I have come to the conclusion that Qt Quick hates me. Or I have a talent of hitting a roadblock within ten minutes, regardless of the general direction. Problem is that the code behind these mouse button associations is awkwardly complex.¹ I plan to remove this mess and replace it with a sane default configuration because I feel it’s just adding clutter without providing much added value. So if you want me to keep this code, please write back. Besides that, I also accept recommendations for a better default configuration. ¹ In numbers: 1127 LOC where the whole application is about 6000 LOC. Since we’re thinking about updating libkdegames, I was just wondering if any developer outside kdegames uses libkdegames. If you are or know such a developer, please write a comment. Looking at my desktop, I see the “Now Playing” applet. It shows the current track from Amarok, and has the basic media player controls (pause/stop/previous/next + seek slider + volume slider). Again, this is about all I need for an user interface while my playlist is filled. I remember that the nowplaying applet communicates with Amarok via DBus using the MPRIS (Media Player Remote Interface Specification) standard. With all these impressions in mind, my target is clear: I want a headless media player which runs in the background and offers an MPRIS-compliant control interface on DBus. Something with a smaller memory footprint. Intensive searches on the internet did not turn up anything of interest. Of course there are command-line music players (e.g. MPlayer), but those expect to be connected to a terminal for control. They cannot be run in the background, and there’s no nice GUI for them (like with the nowplaying applet). It looks like I need to do it myself yet again. 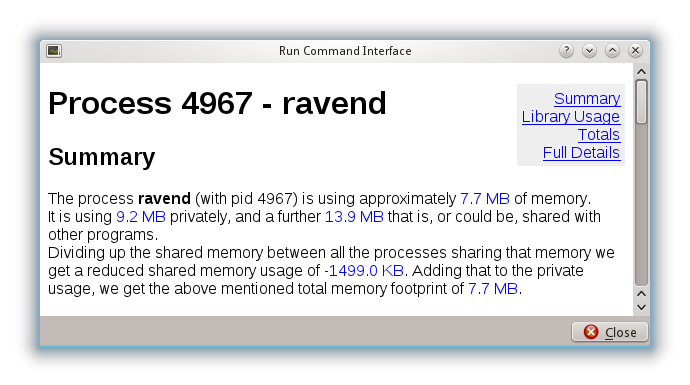 So here is the Raven Music Server (called ravend for short, as it is a daemon), which is now publicly available at git://anongit.kde.org/scratch/majewsky/raven. It currently implements the basic interfaces mandated by MPRIS version 2 (unfortunately the “Now Playing” applet supports MPRIS 1 only). The biggest missing piece is support for editing the track list, so at the moment you need to restart the process to change the playlist. Convenient user interfaces will become available, eventually. Even then, the Raven Music Server will probably not be interesting for end users. Power users may find this project interesting if they like to keep an eye on their system’s memory footprint, or want to have their playback continue even when the X server is terminated, or want to run a full-fledged media player on a headless system. I have some systems where I don’t use Kontact or anything else that makes use of Akonadi, so my Akonadi database is empty. Still I find the Akonadi server and its numerous agents running when I have just started my session. The Akonadi server is only started when some application needs it. So who wants to communicate with Akonadi? After some search, I found that the clock applet on the Plasma panel is the culprit. It has a feature to display events from the Akonadi calendar which is enabled by default (and I don’t want to oppose this choice; it’s a very nice integration feature for people using KOrganizer). So if you want to prevent the Akonadi server from starting on systems where you don’t use Akonadi, or just want to speed up the startup of your KDE session by delaying Akonadi’s startup until it’s actually needed, do the following: Go to the configuration of the clock applet, and disable “Display Events” in the “Calendar” section. 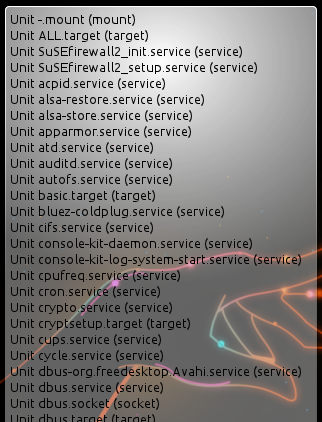 To check whether Akonadi is running, open the “System Activity” monitor with Ctrl+Esc (or by clicking on the second icon from the left in KRunner). Look for a process called “akonadiserver”. (There will also be multiple processes with names like “akonadi_agent_launcher” or “akonadi_whatever_resource”.) You can also manually start and stop Akonadi with the commands “akonadictl start” and “akonadictl stop” (from either the command line or KRunner). What you see here is the very first steps towards systemd integration in Qt. I’ve started to build a libqsystemd, which wraps systemd’s DBus API into something which can be used by Qt applications. The screenshot shows a simple QML-based Plasma applet reading information about available systemd units from a simple dataengine. At the moment, the library can only list available units, providing about 60% of the info which you would get from `systemctl list-units`. But adding more functions should be trivial now that the foundations are laid. The only interesting point left is how different privilege levels will be handled. For example, only root may activate and deactivate units, initiate system shutdown etc. Most properties are even read-protected from normal users. Of course, providing a library interface is only the first step for systemd integration with KDE. The second step is to actually use it. For example, systemd provides standard interfaces for setting the hostname, timezone, etc. in a desktop-independent manner. systemd can in the future also be used to coordinate the startup of a KDE session, and thus replace parts of startkde and kdeinit. The fact that KDiamond is included by default in Plasma Active’s default set of “Favorite applications” (among rekonq-active, calligra-active, and friends) finally made me hack a bit on kdegames stuff again. The main problem I see with KDiamond on a mobile form factor is that menubar and toolbar waste quite some vertical space. Also, the menubar is awful to use on a touchscreen; the toolbar is much better in this regard. Can we combine these observations into an interface that saves space, yet is as approachable as a simple toolbar? We can. After selecting something from a subcategory, the toolbar automatically returns to the default category. For example, if you click on “Settings”, then on “Configure KDiamond”, the theme selection dialog comes up. When you’re done with that, you come back to the main window and find the default toolbar with the relevant New/Pause/Hint actions again. What do you think? A first step in a good direction? Something you would even want on the desktop? Or just plain awful? Please let me know. BTW the source is available on ReviewBoard. P.S. To get that straight: This is only for games with a small set of menu actions (about 28 of 40 KDE games, according to my counting). Apps like KGoldRunner or KTuberling just don’t fit the idea behind this proposal and will therefore not be affected. P.P.S. I’m aware that vertical space is still wasted. I’m going to experiment with moving the toolbar to the side for displays which are wider than tall.